Aaron Cole September 14, 2017 Comment Now! Perhaps you've heard rumors that the new BMW M5 would be all-wheel drive. Or whispers that it would be more complicated than grad-level calculus. Or even hints that it may lack a third pedal for the first time in more than three decades. BMW last month confirmed all of the above. But there's more. Oh, so much more, as we learned this week at the car's world debut at the 2017 Frankfurt Motor Show. 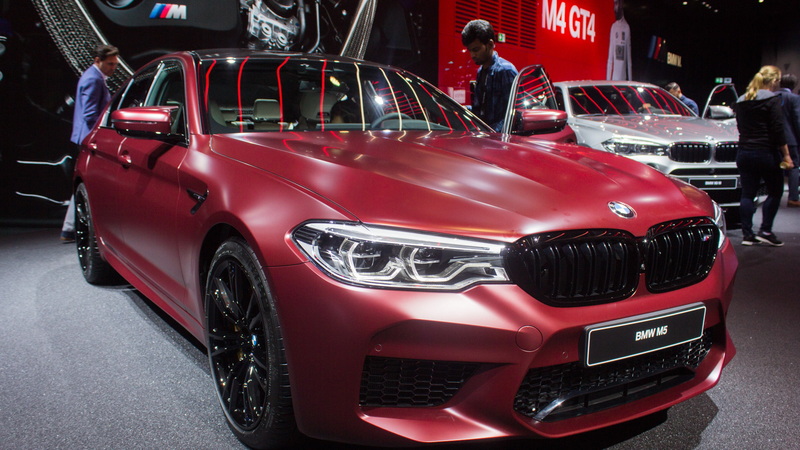 The German automaker announced that the 2018 BMW M5 will arrive in the U.S. next year—sometime after February, but before June—to patient hands willing to likely pay more than six figures for the privilege. The BMW M5 will be powered by largely the same engine found in the last iteration, a 4.4-liter twin-turbo V-8 that's been boosted to 600 horsepower and 553 pound-feet of torque. A special edition of the outgoing M5, sold in extremely limited quantities in the U.S., produced nearly the same power. Power isn't the new M5's only game, though. The new M5 will feature the first application of BMW's new all-wheel-drive system that can be configured for rear-wheel-drive only. According to BMW, the all-wheel-drive system, which BMW calls xDrive, can be specified in rear-drive configuration with traction control systems reduced—or completely disabled. In normal circumstances, the M5 operates in all-wheel drive, which helps the M5 rocket toward 60 mph in 3.2 seconds (compared to 3.6 seconds for the outgoing model). An all-wheel-drive sport mode can be selected for more slip and rearward bias, and a rear-wheel-drive lassez-aller mode can be dialed in and you're on your own, pal. Even with the all-wheel-drive traction, the new M5's newfound acceleration could be partly attributed to help by Jenny Craig. 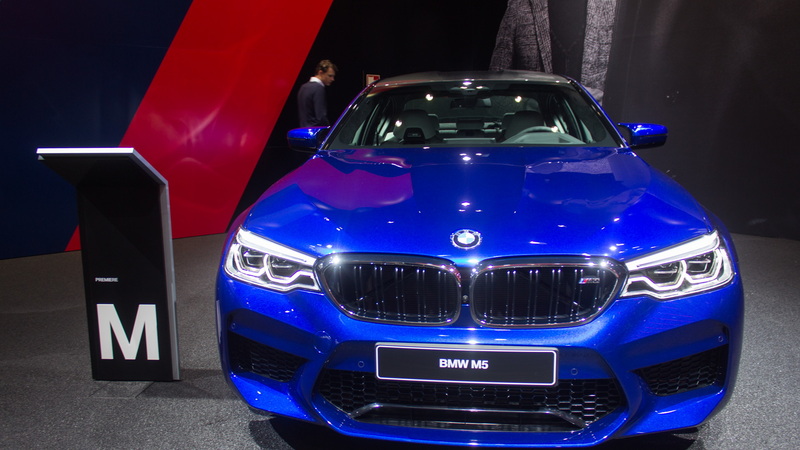 Despite the new, complicated all-wheel-drive system, the new M5 weighs roughly the same as the outgoing M5 and a few dozen pounds less than the 2018 BMW M550i xDrive. 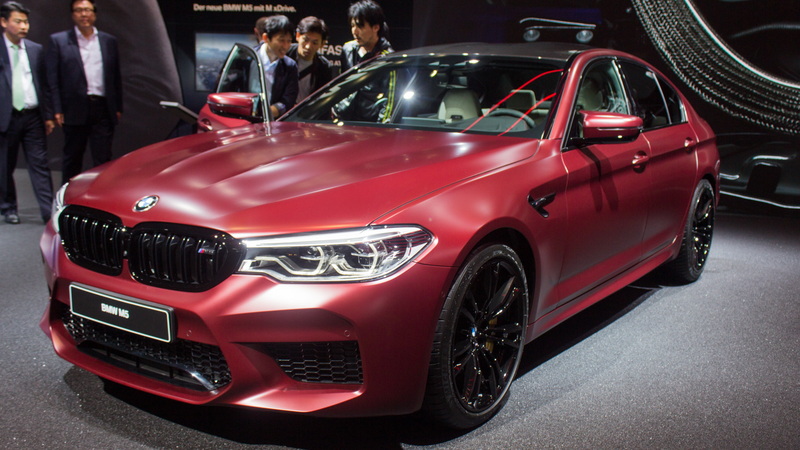 Official U.S. specs haven't been made public, but BMW announced that without pesky humans, the overseas M5 would weigh about 4,090 pounds. Stateside purists may bemoan the lack of a manual transmission on the new M5, but at least no one else will have the option. BMW told us that the new M5 will be offered exclusively with an 8-speed automatic—and that's it. That may not be the end of the story: the last M5 included a competition package and 30-year anniversary model that increased power output and performance. In other words, stay tuned. 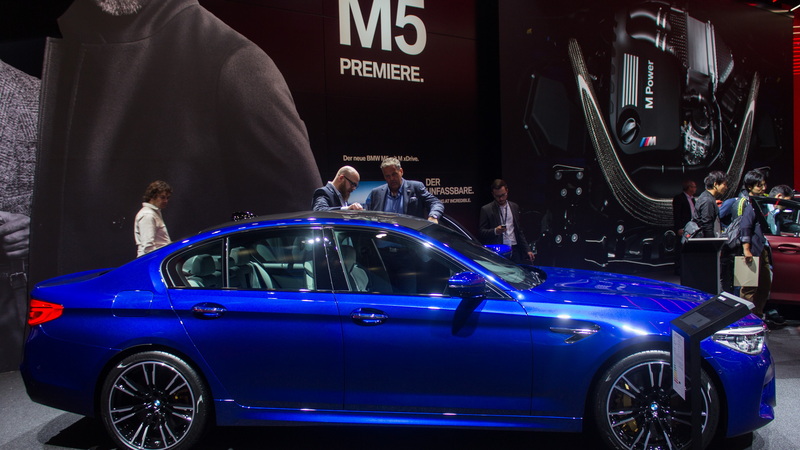 Inside, the M5 acquits itself more toward the driver with a dizzying array of performance settings, steering wheel controls, and transmission-mounted buttons to configure the sedan's power. A new M shifter will debut on the M5, which appears closer to a jet-fighter's thrust lever than a gear selector. A rocker switch on top of the gear shifter can toggle among three settings for transmission behavior and shift speed: Mode 1 for efficient driving, Mode 2 for sporty driving, and Mode 3 for full-on German speed metal. Switches on the center tunnel will control suspension, throttle, and steering behavior with your right foot and courage acting as the last lines of defense. When it goes on sale in spring 2018, the M5 will initially be offered in a "First Edition" trim that adds a numbered plaque, 20-inch wheels, red paint and white leather. Only 50 examples have been dedicated for the U.S. and, wait—they're probably gone. The M5 will ditch its hydraulic rack-and-pinion steering setup for an electronic system with a noticeably quicker ratio. The new rack's speed has been quickened to 14.3:1, which is faster than the last-generation's 12.7:1 setup, but considerably slower than the competition model's impossibly fast 18.0:1. 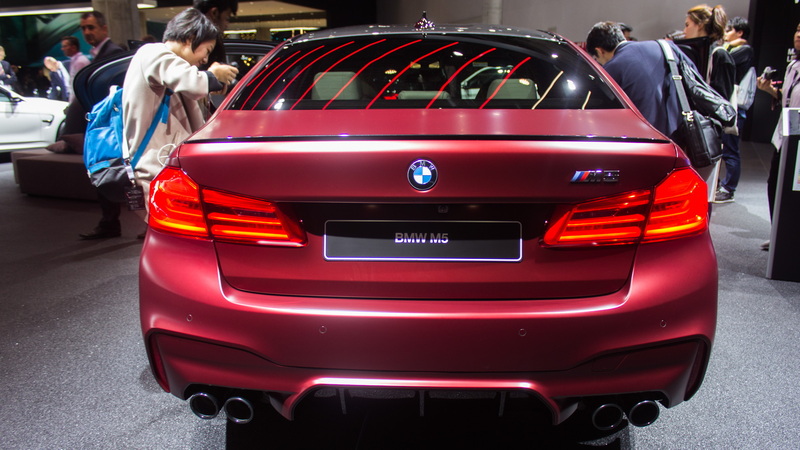 You could say: "Wow, the new BMW M5 has become impossibly complicated for a sport sedan, now." But by the time you say those words, the M5 will be traveling faster than a mile a minute.